The New KastKing® Royale Legend baitcasting fishing reel delivers smooth consistent performance. A Royale legend baitcast reel will keep you fishing all day long. Its over-sized flat-sided EVA foam soft grip reel handle reduces fatigue and delivers a soft, comfortable nonslip grip, even in the wettest conditions. Light weight, low profile baitcaster design fits comfortably in your hand. Its quick access removable side plate gives easy access. This baitcasting reels specs include 11 + 1 shielded MaxiDur ball-bearings, 17.5LBs / 8KG of carbon fiber drag from its smooth, reliable star drag system, 7.0:1 gear ratio, brass gears, and a CNC machined multi-ported aluminum whiffle styled spool that rides on a stainless steel shaft offers maximum strength with less weight. Its sleek black color and bold new look along with it dynamic design gives you the look, feel, strength, and reliability expected from a high price premium baitcasting reel at a fraction of the cost. The new KastKing Royale Legend casting reel with shielded bearings and corrosion fighting features means it could be used for freshwater or saltwater. The Royale Legend makes a great combo when matched to a KastKing baitcasting rod. A cut above its predecessor, the KastKing Royale Legend offers more power, more speed and a bolder look. One-year warranty for recreational fishing use. What kind of rod would be good with this reel? Any casting rod from 6 to 7.5 ft in a medium to medium heavy would be Ideal. KastKing has both all purpose and species specific rods that will match your reel perfectly. 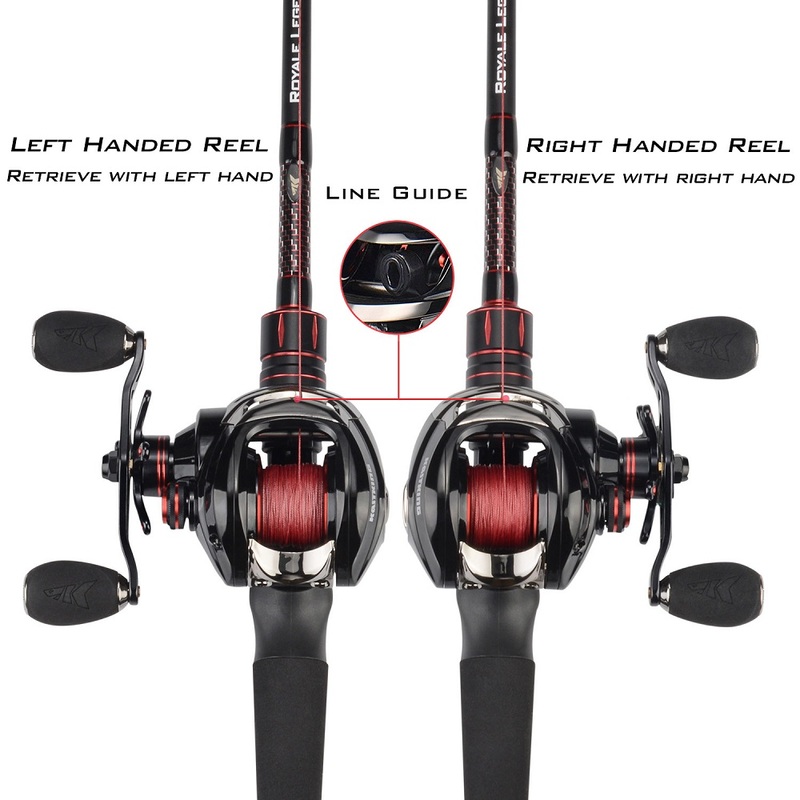 If you are used to twisting the handle by right hand, then choose right handed reel. Does anyone’s reel buzz a lot when casting? All bait casting reels with metal gears and parts can be a bit noisy. Turn the reel upside down and put a drop of oil on the worm gear and make shure the reel and its parts are clean and lubricated. Can be use in saltwater ? I am new on baitcasting reel, is there an instruction of how to use it? What’s the differences between carbon material and industrial plastic?